Note: thanks to some of your comments below, we've adjusted the amount of the brown rice flour blend, to make a firmer dough. 17 mins. to 23 mins. 55 mins. to 1 hrs 5 mins. *See recipe for this blend below. Preheat the oven to 400°F. Grease a divided scone pan, or grease (or line with parchment) a baking sheet. Whisk together the flour or flour blend, sugar, baking powder, xanthan gum, salt, and nutmeg. Work in the cold butter till the mixture is crumbly. Whisk together the eggs, milk, and vanilla till frothy. Add to the dry ingredients, stirring till well blended. The dough should be cohesive and very sticky. Drop dough by the 1/3-cupful into the scone pan or onto the baking sheet; if you haven't added dried fruit, use a slightly smaller amount of dough, about 1/4 cup. Let the scones rest for 15 minutes. 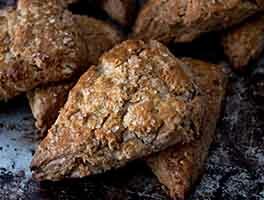 Sprinkle the scones with sparkling sugar or cinnamon sugar, if desired. Bake for 15 to 20 minutes, till golden brown. Remove from the oven and let rest for 5 minutes or so before serving. Best enjoyed warm, with butter and jam. Many of our gluten-free recipes use our King Arthur Gluten-Free Multi-Purpose Flour, which includes ingredients that reduce the grittiness sometimes found in gluten-free baked goods. Our flour also increases the shelf life of your treats, keeping them fresh longer. The following make-at-home blend, featuring stabilized brown rice flour, works pretty well when substituted; and it tastes better than a homemade blend using regular brown rice flour. Whisk together 6 cups (28 1/2 ounces) King Arthur stabilized brown rice flour; 2 cups (10 3/4 ounces) potato starch; and 1 cup (4 ounces) tapioca flour or tapioca starch. Store airtight at room temperature. Note: You can substitute white rice flour for the brown rice flour if you like; it'll make your baked goods grittier (unless you manage to find a finely ground version). I used about half of the sugar and it was still very tasty!! I made these for ST Pats. Used dried apricots and grated some fresh ginger and s little dried ginger. Made 9 perfect scooped scones. Even non gluten free people liked them. 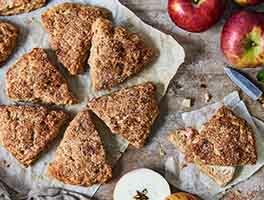 This is now my absolute go to scones recipe. I did add a little more flour as per one of the recommendations- not much maybe 1/8 cup. Delicious! I used my own gf flour blend and made this with almond extract and dried blueberries. I had to make the dough ahead, so I placed it in a covered bowl in the refrigerator then in about 4 hours,, on parchment, I patted the dough into a 7-1/2" round, cut into 8 wedges, and baked for 14 minutes. Will definitely make again and again! Very tasty and satisfying with a soft, light texture. Used dried cranberries and a pumpkin spice blend instead of nutmeg. Will bake again. My scones did not rise as much as expected when I baked them in the scone pan. The only change I made to the recipe was using almond milk instead of regular milk. My add-ins were cinnamon chips and chopped pecans. The scones also did not brown much even after they baked for almost 20 minutes. Any ideas? 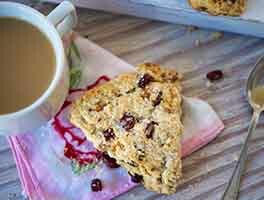 These scones are fantastic, I make them all time with many different flavors and fruits. 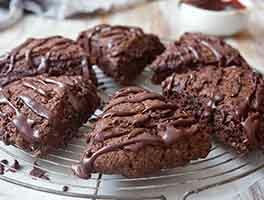 I have played around with the recipe a bit to make them my own but although they taste delicious I can not seem to achieve the texture I am looking for. For me, this recipe produces something that has the texture more akin to a muffin. I would love to get a denser scone while maintaining the delicate crumb. Any suggestions? I found the recipe a month or two ago and finally had time to bake on 17th Jan. The scones were great! 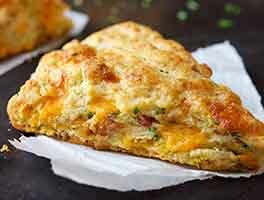 It was crumbly and didnt taste like other gluten-free scones that are very densed. I didn't use the optional ingredients. I confess, very scared to make it! But I came through! It came out perfect! I love scones and now I can enjoy theme gluten free. I just recently discovered King Arthur GF flours. Fantastic! I used their all-purpose flour to make a pie crust for a Christmas pumpkin pie, and then today made this scone recipe. Pretty much followed the recipe to the letter. I used dried cranberries for the dried fruit. Recipes using this flour are just about tbe closest thing to regular wheat flour recipes. Yum! Made these for a tea party and for my friend who is gluten free. I used Namaste gluten free flour which includes xantham gum so I eliminated that from the recipe. Also added 1/4 cup sliced almonds, 1/4 cup chopped dried cherries and 1/4 tsp. almond extract. After baking I drizzled the scones with melted white chocolate chips and topped with a few sliced almonds. They were a hit and delicious. Great recipe! My friends, even the gluten eaters, asked for the recipe. Thanks KA.